When you’re tasked to lead groups, build consensus, and deliver solutions to clients or community stakeholders, the quality of every single interaction matters. Getting your board meetings, community meetings, and internal meetings RIGHT and planning them thoughtfully is a no-brainer, yet so many organizations fail at optimizing these opportunities. Why? Because, surprisingly, many lack key facilitation and people skills to engage others. United Way has become the global leader in engaging and mobilizing people to carry out its mission. Like United Way, we all must avoid poor group management and meeting pitfalls to effectively perform, but doing so requires both an art and a science to harness soft skills – that are often overlooked or untapped. Join Michael Wilkinson, Leadership Strategies’ CEO and Certified Master Facilitator, to unearth these essential facilitation techniques. Learn how United Way – one of the largest community-based organizations in the world – has leveraged group facilitation principles from Leadership Strategies as a “united way” to impact positive change. Join Network for Good's Brian Lauterbach to get tips on smart donor communication for meeting your year-end fundraising goals. How to assess the feelings and attitudes of paid staff around working with volunteers. What does paid staff need to know about working with volunteers. How to create a communication plan to talk to paid staff about working with volunteers. Strategies for engaging volunteers in a union environment. If your nonprofit or library has a small (or non-existant) paid staff and managing your technology is a burden, have you been considering managed IT services or contracting out maintenance? Maybe you already do have some managed IT services, but want to understand whether you're getting the most from the relationship out of your limited resources. Join TechSoup's Cameron Jones and Tech Impact's Linda Widdop to talk about what managed IT services are; when your nonprofit, church, or public library may want to engage in them; and how to best evaluate offers that are out there, including TechSoup's IT Assist program. Over 160 hunger-fighting organizations have used the Program Improvement Tool to evaluate their volunteer engagement programs. Come hear about what we've learned about the tool, the organizations that have used it, and the benchmarks that we're developing. If you haven't yet explored the tool you can find it here http://causes.volunteermatch.org/hungerservice This tool was developed for hunger-fighting nonprofits by VolunteerMatch in partnership with ConAgra Foods Foundation. Aggregate information on the hunger-fighting organizations that have used the tool so far. Trends in volunteer management and volunteer engagement in hunger-fighting organizations. Benchmarks that can be developed based on initial information gathered by the tool. If you're using Intuit's QuickBooks to manage your finances as a house of worship or faith-based organization, join QuickBooks Made Easy CEO Gregg Bossen for a fast-paced 90-minute lesson to improve how you're using it. Join us for this revealing webinar where Dana Ostomel, founder of Deposit a Gift and Firespring’s leading authority on crowdfunding, interviews Lindsay Smith, development officer at DOROT, a nonprofit that has run two extremely successful #GivingTuesday campaigns on the Deposit a Gift platform. As fundraisers, there’s nothing more valuable than sharing knowledge and experiences. In this candid conversation, Lindsay will share her experience firsthand: what worked, what didn’t and what they plan this year. If you’re looking for fast track R&D (rip off and duplicate), this session will provide a wealth of ideas and expert advice. In addition to Lindsay’s valuable insights on how to manage a successful campaign, Dana Ostomel will walk us through how to strengthen and develop vital donor relationships from 11/30 and beyond. Secrets to managing a successful campaign. How to avoid the biggest nonprofit crowdfunding mistakes. What you’ll achieve beyond rising the thermometer. How to celebrate success as a community. Steps to drive momentum through your year-end appeal. When implemented thoughtfully, crowdfunding is one the most powerful tools in your fundraising toolbox. Without effective planning, implementation and an engaged community of potential supporters, even our most powerful tools and ideas won't produce results. In this webinar, join Dana Ostomel, Firespring's Vice President of nonprofit industry development and leading crowdfunding authority, to discover the secret sauce of crowdfunding and everything you need to cultivate a community primed and ready to give in an age where online social networks drive results. Dana will begin by laying the foundation for what crowdfunding is and its critical role in your organization's integrated fundraising approach. From there she will guide you through a 10-step road map of what actions you should take between initiatives to cultivate an engaged and responsive community. You will walk away with a deep understanding of why investing in your online network can pay dividends when nurtured correctly and why it matters that much more in an online social world where you need "helpers" to get noticed amidst the noise. We guarantee you’ll walk away feeling confident in the steps you need to take to earn the trust and vigorous support of your online community with tons of ideas for integrating crowdfunding into your fundraising initiatives. How to understand the role that culture plays in an organization's volunteer engagement plan. Ways to identify opportunities within your organization to create a more open and inclusive culture for your volunteers. 3 steps to creating a healthy nonprofit culture. 5 revealing stats about employee engagement. Nonprofit culture in action (4 case studies). How to self-assess your culture. Did you know that 53% of donors lapse because of poor donor communication? Though social media usage has become pervasive among nonprofits, it is still used primarily for promotion. Those organizations who are utilizing networks like Facebook, Twitter and Instagram to show authentic and personalized appreciation to supporters are reaping the benefits of increased engagement and donor loyalty. This session will help you discover how to maximize your nonprofit’s social media accounts through thankfulness, instead of promotion. We will examine real-life examples of effective social media usage from organizations large and small, as well as the latest research into what works and what doesn’t. 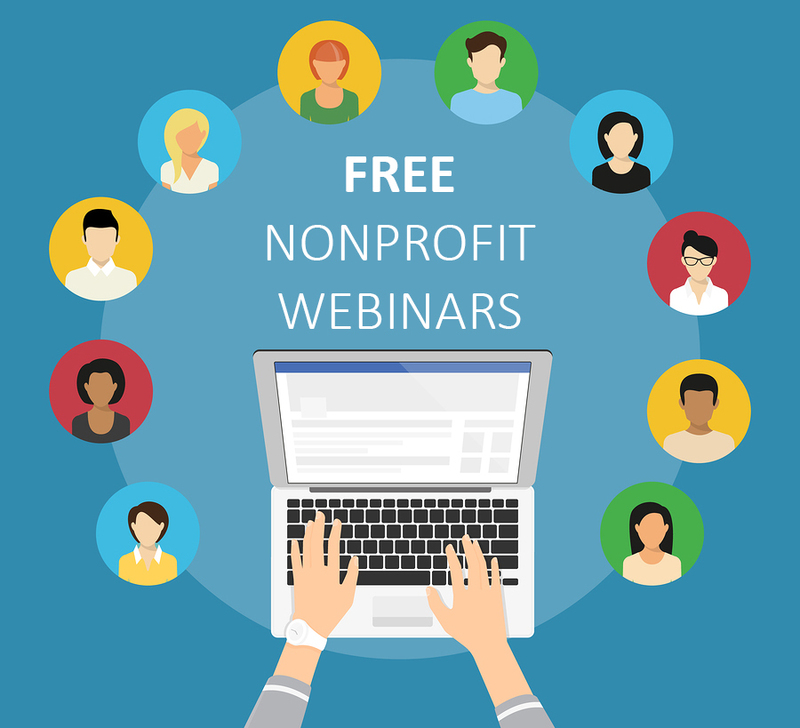 This free webinar, presented by volunteer management expert Stacy Ashton, will take you beyond the idea of volunteers as “free labour” and explore how your volunteers currently contribute to your donor base, goodwill in the community and the labour force. From there, we’ll learn how to benchmark and track the full impact of your volunteers on organizational success, and build strategy to connect those impacts to fulfilling your mission. learn how to collect data and build rationales for effective resourcing of volunteer infrastructure. better understand the role of volunteer engagement in driving your organization’s mission. learn how to measure and maximize the impact of volunteer engagement on mission achievement, fundraising, community reputation, community reach and talent acquisition. When it comes to broadband in public libraries, it seems you can never have enough. Technology use in libraries is at an all time high. Without enough bandwidth coming into the library, patrons are unable to do stay connected and staff productivity is blocked. Come to this free webinar to learn how to plan for broadband and how to pay for it. Guests Emily Almond and Amber Gregory will share E-Rate and broadband tips and tricks, and will include a special look at extra funding available through E-Rate 2.0, available only for a limited time. Tableau allows anyone to quickly see and understand their data. This free webinar will touch on core concepts in data visualization and show how Tableau empowers everyone in an organization to see, understand, and make decisions informed by their data. Learn how to connect to different data sources, explore different chart and dashboard types, and discover the powerful analytical tools built right into the software. The initial set of visualizations will be built around a UNHCR data set on refugee migration flows between 2000-2015, but will represent basic functionality that extends to nonprofit fundraising, program management, advocacy, or impact evaluation. With five weeks left before the biggest giving day of the year, we're all systems go for #GivingTuesday on 11/29. If your current #GivingTuesday plan is to email a link to your “Donate Now” page and hope for the best, you still have time to implement a powerful strategy. Dana Ostomel, founder of Deposit a Gift and one of the nation's leading authorities on crowdfunding, will take you step-by-step through creating your 9-week communications plan and implementing your best giving day ever. A successful #GivingTuesday lasts well beyond a one-day event, as long as your plan includes a strategy that starts on #GratefulWednesday. Whether you began laying a foundation in May or have just started to develop your plan, you'll leave this webinar with a tactical plan for priming your community to give. Join Dana to learn that you don't have to “throw a Hail Mary” and discover how to score big on #GivingTuesday and beyond. Identify communication channels & unleash their power. Develop your week-by-week action plan. Gain practical ideas to mobilize your community to spread the word & GIVE! Successfully integrate #GT into your year-end appeal. Learn how to leverage your momentum after the campaign. Writing a compelling fundraising letter can be tricky. It’s not the same kind of writing as a brochure, annual report or grant proposal. But it’s not rocket science – it’s something you can easily learn; just not something most of us are taught. In this webinar you’ll learn the art of taking your appeal from run of the mill to… out of the ballpark. From anesthetizing to… astounding. From colorless to… captivating. Your appeal letter should be an “offer” to join you in something amazing and transformative. Whether you’re an old pro and just want some new tips, or you’re writing your appeal letter for the first time, you’ll find killer strategies and tried-and-true tactics to get your appeal to the next level. Which words to use a lot of – and which words to never use!